Cold laser therapy is low-intensity laser therapy, or laser therapy that uses low levels of light to stimulate healing. Unlike surgical or aesthetic lasers, it does not cause your tissues to heat up. Cold laser therapy is sometimes called low-level laser therapy (LLLT), low-power laser therapy (LPLT), or soft laser. You may also hear it referred to as therapeutic laser, biostimulation, or photobiomodulation. Low-level light is applied directly to the problem area. The tissue then absorbs the light. In a basic sense, this leads to a biological or chemical reaction to red and near infrared light. Damaged cells have a physiological reaction that helps promote their regeneration. The technique is called “cold” laser therapy because the low levels of light are not enough to heat your body’s tissue. The level of light is low when compared to other forms of laser therapy, such as those used to destroy tumors and coagulate tissue. Differing wavelengths and outputs are used, depending on the purpose of the treatment. Generally speaking, wavelengths between 600 and 700 nanometers (nm) are used to treat superficial tissue. Wavelengths between 780 and 950 nm are used for deeper penetration. During the procedure, you’ll feel the device against your skin, but it creates no heat, sound, or vibration. Even better, it is completely noninvasive and painless. Most of the time, one treatment will take only a few minutes. Seeking Out Pneumococcal Disease Vaccination? Information Inside. 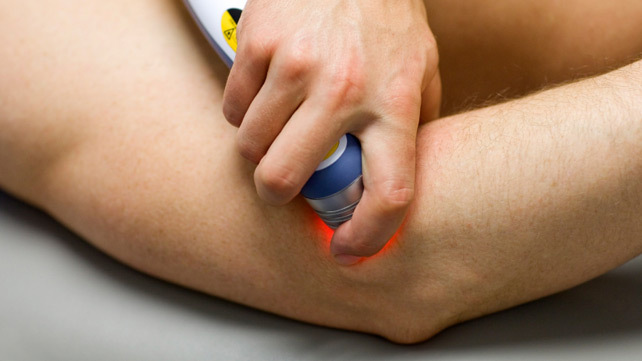 What Is Cold Laser Therapy Used For? Sports medicine and physical therapy practices use cold laser therapy in the treatment of minor injuries and sprains. It is used to help reduce swelling and promote healing of the joints and soft tissue. Dentists use cold lasers to treat inflamed tissues in the mouth and to heal ulcerations. Doctors also use it to treat inflammation caused by arthritis and other chronic autoimmune diseases. Pain clinics use it to help people who suffer from chronic pain. Therapeutic massage therapy sometimes involves cold laser therapy. Cold laser therapy is used to promote skin rejuvenation. Dermatologists use it to treat various skin problems such as ulcers, burns, inflammation of the skin (edema), and rashes (dermatitis). Cold laser therapy is being used to treat hard-to-heal wounds, including wounds related to diabetes. Acupuncturists use cold laser therapy for clients who are uncomfortable with needles. The low-level laser beams can stimulate your acupoints the same way needles do, but without piercing your skin. The potential for new applications of cold laser therapy is virtually limitless. There is hope that it will someday be used to treat traumatic brain injury, spinal cord injury, and degenerative nervous system diseases. Researchers are studying its use in Alzheimer’s disease and Parkinson’s disease, among other illnesses. The use of cold laser therapy is growing in traditional medical practice and as complementary or alternative therapy. Under the care of a doctor or qualified practitioner, cold laser therapy is considered safe. Also on the plus side, it’s noninvasive, painless, and there’s no need for medication or other preparation. There are generally no side effects or reported adverse events. One of the drawbacks may be time. While each session only takes a few minutes, it may take a series of treatments before you can gauge its effectiveness. The home market for cold laser therapy devices is booming. These products are marketed for use in treating general aches and pains. If you’re considering purchasing a device for home use, there are a few important things to consider. First, lasers vary in their output and some may not have the output they claim. Some are actually nonlaser light-emitting diodes (LEDs). Second, some cold therapy products sold for home use make bold claims about what they can do. Some are marketed to help you lose weight, stop smoking, or grow hair. Others advertise they can treat migraines, high blood pressure, wrinkles, or other problems. Some of these claims may be unsubstantiated. Research into the effectiveness and safety of cold laser therapy is ongoing. If you’re interested in cold laser therapy, speak with a doctor, physical therapist, or other medical professional to find out if it makes sense for you.